Ipswich were formed as an amateur club. The side played amateur football until 1936. The club turned professional and was elected into the Southern League. They started in the Third Division (South). their first success came in the 1953-54 season when they won the title. Ipswich found life in the Second Division tough and a year later they were down again. The appointment of Alf Ramsey as manager in succession to the successful Scott Duncan proved a shrewd move. In 1956-57 Ipswich won the Third Division (South) title again. The club really sprang to prominence when they won the Second Division in 1960-61 and the First Division Championship a year later which meant they had qualified for the European Cup. Ipswich went out in the second round to eventual winners AC Milan after overcoming Floriana of Malta 14-1 on aggregate on their baptism. It was back to Second Division football, however, by the end of the 1963-64 season with Ramsey having left to manage England and Jackie Milburn now in charge. Milburn resigned at the start of the following season, and Bill McGarry came from Watford to take over. Under McGarry the club regained its First Division status in the 1967-68 season, but in November 1968 McGarry left to go to Wolverhampton Wanderers, and after a period of Cyril Lea in charge as caretaker-manager, Bobby Robson was appointed in January 1969. Robson did not have an easy start, but once he had stamped his mark on the club it really took off. In 1973 and '75 Ipswich won the FA Youth Cup before winning the FA Cup in 1978 - exactly 100 years after they had been formed as an amateur club. The late 1970's saw the arrival of Arnold Muhren and Frans Thijssen, the two Dutchmen who made such an impact on the team and with the supporters, and they helped Ipswich win the UEFA Cup in 1981. The First Division Championship eluded Robson's team on more than one occasion, but in 1982, following the World Cup in Spain, Robson became the second Ipswich manager to take over the England post. For some time previously Robson had been linked with clubs both at home and abroad, and it was no surprise when he took over the top job in succession to Ron Greenwood. Ipswich decided to keep it in the family and Robson's job went to Bobby Ferguson, his chief coach during the glory years. Bobby had a difficult job in following Robson and tragically the Team slipped into the Second Division in 1986. Former Chesterfield boss John Duncan took over in June 1987. Three seasons of mid-table positions led to Duncan becoming the first Ipswich Manager to be sacked in 1990. John Lyall was appointed from Tottenham in May 1990, and in his first season started to re-shape the Club. In 1991-92 Lyall's men were Second Division Champions and a whole new chapter in Town's history was about to begin. Ipswich Town's first season back in the top flight coincided with the launch of the FA Premier League. At the start of the season most Town fans would have been happy had the Club just avoided relegation. In reality Ipswich got off to a flying start and before Christmas supporters were talking about a return to Europe. In the New Year cup defeats in the quarter final stages of both the FA Cup and Coca Cola Cup made a dent in Town's confidence. 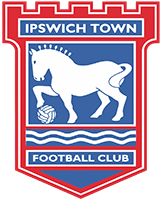 Early season form could not be maintained and Ipswich flirted with the relegation zone. The drop was avoided and Town, in fact, finished a creditable sixteenth. Two seasons later, Ipswich Town found the going just too difficult in the Premier League and John Lyall, who had taken a back-seat managerial role at the club resigned just before Christmas. Former favourite, George Burley took over in the hot seat but could not save Ipswich from the plunge into the first division. Ipswich narrowly missed out on the playoffs in their first season in Division 1, before making it the following three years, losing out in the semi-final each time, including narrow defeats on the away goals rule against Sheffield United and Bolton Wanderers. On their return to the top flight Ipswich were tipped by most for an instant return to Division One, but instead they took the Premiership by storm, staying in the top six for most of the campaign and reaching as high as third. A place in the Champions' League was a possibility until the final day of the season, with Town eventually ending in fifth to qualify for the UEFA Cup in their highest placing in the top-flight since the 1981-2 season. The success was not to last. A less than consistent season in 2001/2 saw Ipswich Town finish 3rd from bottom of the Premier League and a return to First Division Football. It was not all bad news for Town that Season however, and the Ipswich Town Reserves under the leadership of Coach Dale Roberts picked up the Barclaycard Premiership Reserve League (South) Championship title. In addition, the Blues qualified for Europe for a second successive season by virtue of the Fair Play Award. Town's first season back in Division 1 got off to a poor start culminating in the departure of manager, George Burley in early October 2002. Tony Mowbray took over temporarily until new boss, Joe Royle, was appointed at the end of the month. Despite financial problems off the field, culminating in a period of temporary Administration, Royle rekindled Town's play-off hopes until the last few matches of the season. It was to no avail and our final league position of 7th meant another season of Division One football was the inevitable outcome. The start of 2003/04 was a nightmare with Town bottom of the First Division in September but Royle brought in a number of loanees and turned the fortunes of the Club around. A nervy last day of the campaign booked a place in the Play-Offs with a 1-1 draw with Cardiff. A 1-0 win over West Ham in the Semi-Final first-leg at Portman Road put Blues on the brink of a trip to the Millennium Stadium but it wasn't to be, Hammers storming back to win 2-0 at Upton Park and take the tie on aggregate. It was a case of deja vu the following year as West Ham once again stopped Town progressing to the Play-Off Final at the Semi-Final stage but that didn't tell half the story. Blues led the Championship table by 6 points in March but were pipped to the two automatic promotion places on the final day of the campaign - losing out to Sunderland and Wigan. Town's 2005/06 campaign finished at a disappointing 15th place. A new era had begun and in December 2007, another chapter was written into Ipswich Town's history when British entrepreneur, Marcus Evans, became the major shareholder in the Club. With him came substantial investment as Blues stepped up the bid to return to the top flight of English football. Town parted company with Jim Magilton in April 2009 after almost three years in charge and surprised the football world by appointing former Manchester United skipper Roy Keane as his replacement. After around 18 months in the Portman Road hotseat, Keane was relieved of his duties by owner Marcus Evans and installed former Bradford and Wigan boss Paul Jewell as Town’s new manager. The Liverpudlian steered Blues away from relegation after taking over in January 2011, before Town finished the following season in 15th place after enduring a real rollercoaster of a campaign. Paul remained in charge as the current term kicked-off but after a disappointing start to the season, the former Derby manager agreed to leave his post following a defeat to, ironically, Derby at Portman Road. On November 1st 2012, Mick McCarthy was announced as the Club's new manager, signing a contract until the end of 2015 and installing Terry Connor as his assistant. The contract was late extended until summer 2017.